“Are we in for a sell-off?”. At WT Wealth Management, we have taken the time to review and analyze what we believe are the most likely risks to the current bull market, which has entered its seventh year. Risks to the world economies remain modestly to the downside, and drivers include weak global growth and a sudden change to expectations regarding the U.S. Federal Reserve’s interest rate path. In several quarterly economic outlooks we have reviewed, many experts speculate a 20-30% chance of an economic “hard landing” for China, though it is the world’s second-largest economy. The potential for policy errors in China are real—and all the more so, since a new bubble appears to be building in the property market. 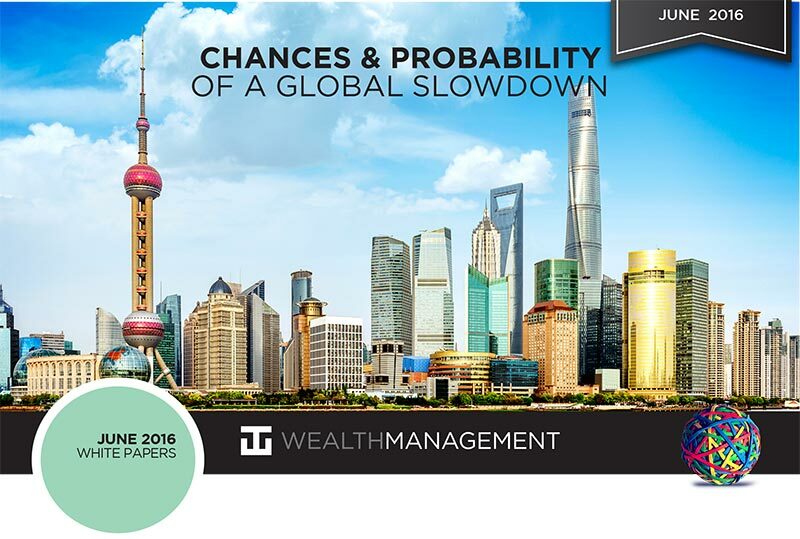 We at WT Wealth Management have favored more developed countries such as Japan and the European continent over China and emerging markets, regarding our international equity allocations. Most economists have China’s GDP pegged at 6.5% this year. A sharper-than-expected deceleration in the Chinese economy could reverberate around the world. 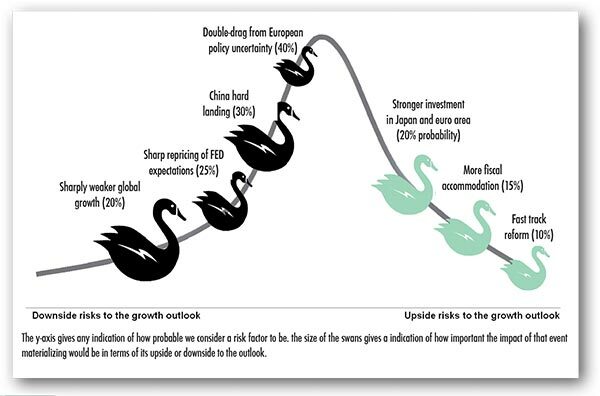 We term risks like these a “black swan” — a metaphor for surprise events that severely affect the global economy. Uncertainty about Europe’s political direction is another risk to the world economy. The near-election of a far-right president in Austria this month, coupled with the U.K.’s upcoming referendum on leaving the European Union, have brought regional politics into sharper focus. Many economists forecast a 40% risk that an unexpected political turn in Europe could double the drag from policy uncertainty on economic growth. With a very busy political agenda lined up for the coming quarters, the risk of an event delivering an unexpected outcome remains high, be it the OMT (outright monetary transactions) judgment from the German Constitutional Court on June 21, the U.K. ‘Brexit’ referendum on June 23, the election of Spain’s 12 Cortes Generales on June 26, the Italian constitutional referendum in October, and, heading into 2017, elections in France, Germany, Netherlands, and possibly Italy. Furthermore, most economists see growth in the 19 Eurozone countries averaging 1.6% so far this year—hardly a rip-roaring economy. Another potential “black swan” for the U.S. economy could be a disorderly repricing of market expectations of when the Fed will raise rates again. In our view, markets are mulling whether the Fed will raise rates in June or July, but we believe the next hike will not occur until July, and possibly even December. Early forecasts have the central bank raising rates by 25 percentage points three times in 2017, but insufficient economic data is available to play that guessing game. However, if the Fed sends too hawkish a message, the risk is that the repricing could turn disorderly. On the flipside, too dovish a Fed could see bond markets unnerved by higher inflation readings and an ever-tighter labor market. Many see ongoing policy divergence between the Fed and other major central banks. The Bank of Japan is expected to continue on its current policy path, and the European Central Bank is presumed to taper quantitative easing between March and December 2017. Most economics students believe that the most pressing risks of a global recession had eased in the last several months, but that a sharp disappointment to global growth would still pose a major risk to most global economies. A prolonged negative market response is the most likely mechanism, other than an outright recession, to take a slowdown. Global growth continues, but at a sluggish pace that leaves the world economy more exposed to risks, according to the IMF’s (International Monetary Fund) latest World Economic Outlook (WEO). The WEO forecasts global growth at 3.2% in 2016 and 3.5% in 2017—a downward revision of 0.2% and 0.1%, respectively, compared with the January 2016 Update. The WEO projects that growth in developed economies will remain modest, at about 2%. The recovery is hampered by weak demand and partly held down by unresolved crisis legacies, unfavorable demographics, and low productivity growth. In the United States, expected growth this year is at 2.4%, with a modest uptick in 2017. Domestic demand will be supported by improving government finances and a stronger housing market that will help offset the drag on net exports coming from a strong dollar and weaker manufacturing. In the Eurozone area, low investment, high unemployment and weak balance sheets weigh on growth, which will remain modest, at 1.5% this year and 1.6% next year. In Japan, both growth and inflation are weaker than expected, reflecting in particular a sharp fall in private consumption. Growth is projected to remain at 0.5% in 2016 before turning slightly negative, to –0.1% in 2017, as the scheduled increase in the consumption tax rate takes effect. Slowing growth in oil exporters, with oil price declines and a still-weak outlook for non-oil commodity exporters including Latin American nations. The modest slowdown in China, where growth continues to shift away from manufacturing and investment to services and consumption. Deep recessions in Brazil and Russia and weak growth in some Latin American and Middle Eastern countries, particularly those hit hard by the oil price decline, intensifying conflicts, and security risks. Diminished growth prospects in many African and low-income nations, due to the unfavorable global environment. On the positive side, India remains a bright spot, with strong growth and rising real incomes. The ASEAN-5 economies—Indonesia, Malaysia, Philippines, Thailand, and Vietnam—are also performing well. And Mexico, Central America, and the Caribbean are beneficiaries of the U.S. recovery and, in most cases, lower oil prices. A return of financial turmoil, impairing confidence. For instance, an additional bout of exchange rate depreciations in emerging market economies could further worsen corporate balance sheets, and a sharp decline in capital inflows could force a rapid compression of domestic demand. A protracted period of low oil prices could further destabilize the outlook for oil-exporting countries. A sharper slowdown in China than currently projected could have strong international spillovers through trade, commodity prices, and confidence, leading to a more generalized slowdown in the global economy. Shocks of a noneconomic origin related to geopolitical conflicts, political discord, terrorism, refugee flows and/or global epidemics loom over some countries and regions. If left unchecked, these shocks could have significant spillovers on global economic activity. On the upside, the recent oil price decline may boost demand in oil-importing countries more than currently envisaged, spurred by possible consumer perception that prices will remain lower for longer. More aggressive policy actions to lift supply-and-demand potential could foster stronger growth in both the short and longer term. The WEO emphasizes a three-pronged approach of mutually reinforcing policy levers: (1) structural reforms; (2) fiscal support, with growth-friendly composition of revenue and spending, and fiscal stimulus where needed and where fiscal space allows; and (3) monetary policy measures. There is strong need and scope for further structural reforms. WEO analysis finds that labor and product market reforms in advanced economies can give a strong boost to growth prospects over the medium to long term. Carefully prioritizing and sequencing reforms is essential to boost their short-term effects. Product market reforms—which aim to boost competition among firms and facilitate starting a business or attracting investment—should be implemented forcefully, as they boost output even under weak macroeconomic conditions and without weighing on public finances. Where possible, narrowing unemployment benefits and easing job protection should be accompanied by other policies to offset their short-term cost on vulnerable groups. In many advanced economies, accommodative monetary policy remains essential to support economic activity and lift inflation expectations. In many emerging market and developing economies, monetary policy must grapple with the effects of weaker currencies on inflation and private-sector balance sheets. Exchange rate flexibility, where feasible, should be used to cushion the impact of terms of trade shocks. 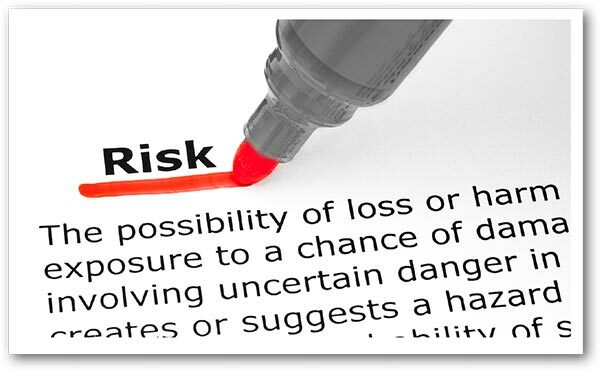 The WEO warns that policymakers also need to make contingency plans and design collective measures for a possible future in case downside risks materialize. Cooperation to enhance the global financial safety net and global regulatory regime is also central to a resilient international and financial system. 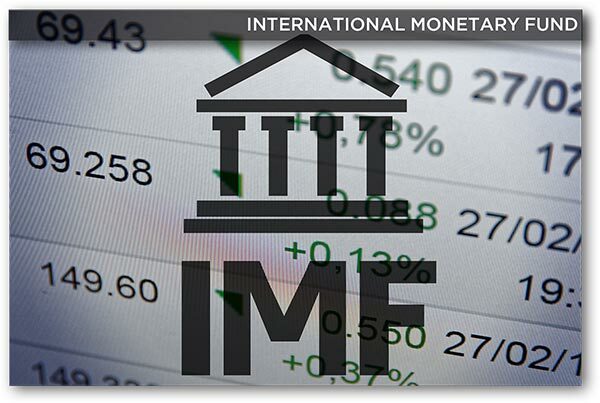 The IMF has warned that the recovery remains too slow and fragile, thus can damage the social and political fabric of many countries. Also, persistent lower growth means less room for error, thereby reducing potential output, and with it, demand and investment. The current diminished outlook calls for a proactive response—not head-scratching and “more of the same.” To support global growth, we need a more potent policy mix—a three-pronged policy approach based on structural, fiscal, and monetary policies like the one the WEO proposes. If national policymakers were to clearly recognize the risks they jointly face and act together to prepare for them, the positive effects on global confidence could be substantial.